The summer is rushing by and I haven’t had time to document all of the fun we have been having! Let me tell you about this afternoon. Amara’s Mom had an appointment so Amara came over and spent part of the afternoon with me — Grandpa was at work — I had her all to myself. We had a blast. We crammed a whole lot of fun into 90 minutes! It started with playing follow the leader. I have to admit that I can not hop around the house nearly as easily as she does but it was fun. I’m sure I burned a few extra calories today. This was followed by lunch and Sponge Bob — it’s what we do! We had macaroni & cheese, an apple, a bunch of carrots and Ants on a Log, fresh celery stuffed with creamy peanut butter and topped with raisins! Amara had never had this before but we discussed it in advance and she thought she would try it. She says she wasn’t crazy about it but she eat 6 pieces! Then it was off to the backyard to swing and giggle! We have been so lucky this summer to have some perfect weather. Today it was 76°, it doesn’t get much better than that. 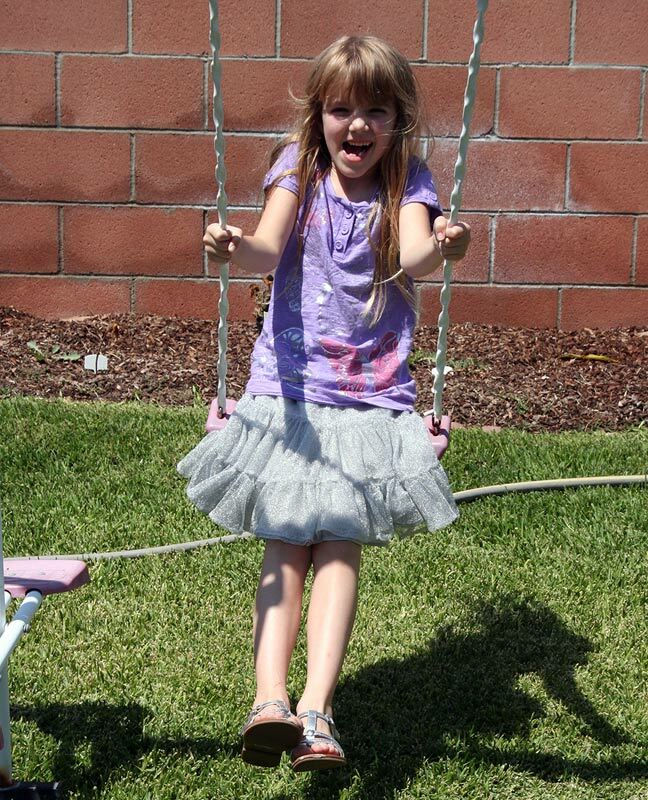 When Amara tired of swinging she decided she wanted to play Princess. She turns to me with that devilish grin she gets and says “And you can be the evil witch”. She knows I hate being the evil witch. I stood there for a minute and I said “No, you be the evil witch. I want to be the Princess.” I loved being the Princess and I was awesome with my crown and wand. And she made a great evil witch. Now the evil witch did not like singing so of course the Princess went singing through the forest. She caught me. First she took my voice away. Then she froze me — but my magic wand un-froze me! The evil witch captured me again and this time took me to the tower and tied me up with a red ribbon from one of her bears. And then Mommy got back. This memory was posted in Backyard Fun and tagged babysitting, evil witch, games, Princess, Sponge Bob, swingset on August 6, 2010 by Grandma Kc. Not your ordinary Christmas caroling Poison Apples Can Amara come out and play? Thank God Jenna got back when she did! You could have been stuck in the tower until Grampa got home!!!! So glad you girls had a fun day!!! Good think I had left the front door unlocked for her in case we were out in the backyard playing! Rescued by my daughter from my granddaughter! The greatest thing about the digital age is all the memories that don’t get lost And we get to be the right age to appreciate the difference. What we should really appreciate is that because of blogs like this they really are memories and not just dim recollections stirred by mute photographs – so hip hip hooray for the blogging grandmas and their subjects, especially my own Wifey Wiferson and the Amazing Amara. Well I agree with “Grampy”! These grandparent blogs are timeless and our grandchildren’s grandchildren will be able to call them up at a moment’s notice and see proof of how wonderful we all were! I love reading these cute little “sagas” from Amaraland! She has such an imagination, and of course, grandma is no slacker when it comes to cooking up fun things to do! Another grand adventure! Love reading them. Part of the fun of reading your posts is that they always give me ideas of things to do with my grandsons. Believe it or not, I’ve not yet played Follow the Leader with Bubby! Must remedy that…soon! I have not played Follow the Leader yet with Brent NOR done ants on a log …I used to make them with my kids and totally forgot about them until reading your post! What fun pretending. My oldest loved to play that I was a neighbor and I would come over for tea. She would ask me what name I wanted to use and I would say Ada May, and she would argue that she didn’t care for that name and I’d argue back that I loved that name…the arguing was fun too 🙂 Thanks for linking with me!